Come Join us and hone your nautical skills, meet new friends and get out sailing. To introduce new members into the Oakville Yacht Squadron (OYS) through providing a safe and fun environment for new members to participate in the club, meet new friends and develop their sailing and boat management skills. Currently, the Oakville Yacht Squadron maintains two Capri 25 keel boats. These day sailing keel boats are used for training and for the use of the Borrow-A-Boat members (BAB). These boats are available to BAB members to book and take out onto Lake Ontario for a pleasure sail, a practice run or a club race. Subject to the weather, the boats can be taken out for a morning, afternoon or evening sail from June to September on the condition that there is a qualified skipper in command and there is at least one competent crew member on board. BAB Members are encouraged to sail together and develop friendships so that there is always an experienced sailor to reach out to and sail with. They are also encouraged to join with other OYS members who own boats to crew with them as these boats need crew to race or go out for pleasure sails. The OYS is a Club of passionate sailors – sailors who also enjoy socializing in the club and participating in social events that run all year around in the Club’s facilities. 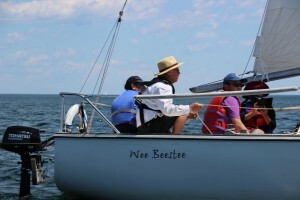 Safety is the Club’s primary concern which matches the OYS objective to promote sail boat training. BAB members who wish to skipper must demonstrate their qualifications through successful completion of recognized sailing courses and related experience. Adult sail boat training is available at the Club if needed for both skippers and crew. ificant part of sailing. By their nature, sail boats are pulled, twisted and battered, so BAB members are expected to keep the boats clean, go over the check list when taking a boat out and to participate in periodic maintenance to deep clean, repair and upgrade the boats – another learning opportunity for a prospective boat owner. As well as introducing new members to the Club and developing sailing skills, the BAB Program offers an opportunity for members who would like to keep a sail boat at the OYS facilities put in their name for a slip when one becomes available. In this regard there are two types of memberships available to BAB members. One is the Associate Member who, in addition to being a BAB Program member, has access to all the social benefits of the Club, The second is a Full Member who is also a voting member of the club and can acquire seniority points towards acquiring a boat slip at the OYS facilities.